Even when the name of your best friend is Jacco Gardner it’s kind of a bold decision to quote from Pink Floyd’s debut, The Piper At The Gates Of Dawn (1967) to grace your own debut album. Overconfident or not, Hugo van de Poel at least shows that he’s got a fine taste in music. From an early age he and Gardner listened to Syd Barett, The Zombies and Billy Nicholls. This eventually led to the band The Skywalkers that was a small hit in the Dutch freak scene. Hereafter both chaps decided to focus their attention onto their solo projects. Gardner’s Cabinet of Curiosities (2013) proved to be very successful leaving van de Poel outside the spotlights. That is, up until now. Because this month under the alias Earth Mk. II he released Music For Mammals on Excelsior Recordings. And guess what, Gardner acts as the album’s producer, so there is no surprise that Music For Mammals is all about sixties psych pop. Also Music For Mammals is the umpteenth psychedelics record this year and some courage is needed when entering this already full market. Yet courage is not the only prerequisite for success. Earth Mk. II needs to find a way to be distinctive from the others bands in this genre. And I wonder if there is any space left to do so. Earth Mk. II starts Music For Mammals with a certain freshness because the first three of are in fact pretty nice. The Warden, Only Human and Timelapse meander between light-footedness and estrangement. Earth Mk. II does a good job arranging fleeting and heavy guitar play with supporting organs and precisely placed background vocals. Notably van de Poel makes use of voice distortion that, alas, frequently makes him sound aloof. In some cases this effect actually causes the singing to drown within the richly instrumented tracks. However in other cases the prefabbed shaky voice also causes a sense of soothing integrity. Marina Tadic is responsible for many of the soft backing vocals but is in the lead on Memories, a track that stands out when compared to the rest of the songs. Memories is deprived from the looseness that is brought in by Gardner. Tadic shows that with a few basic resources, a simple guitar and her soothing voice, the same dreamy effect can be created. The rest of the work continues without any real highlights. Now and then tracks such a My Universe display a cheerless melancholy. Yet most of the time Gardner’s mark of echoing guitars and catchy organ melodies dominate the production. Don’t Mind Me and Here I Am serve as fine examples but don’t bring me to the edge of my seat. Whilst musically frivol, vocally the album isn’t very vivacious. In the end I have to conclude that Music For Mammals is an interesting debut that succeeds in creating a bridge between the clear and the blurry. 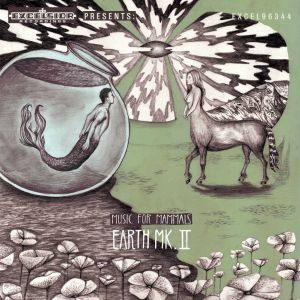 Earth Mk. II rightfully deserves a compliment for not letting ‘the out of focus aspects’ to get out of hand and being playful at the same time. Pushed by Gardner’s arrangements van de Poel attempts step outside the box of contemporary psychedelics. More or less this is also a fine attempt to appreciate. Nonetheless critical listeners will undoubtedly notice the heard playfulness is very carefully thought through. In the very heart of the matter I think this makes album someway colourless. Furthermore Music For Mammals shows the symptoms of being overproduced which makes the album partly a missed opportunity to seriously make an impression within this booming genre. And that’s a bit of a shame if you ask me. This entry was posted in WRM and tagged Billy Nicholls, Cabinet of Curiosities, cd, cheerless, contemporary psychedelics, Earth Mk. II, Excelsior Recordings, frivol, Hugo van de Poel, Jacco Gardner, Marina Tadic, melancholy, Music For Mammals, organ, Pink Floyd, psych pop, psychedelics, review, sixties, Syd Barett, The Piper At The Gates Of Dawn, The Zombies. Bookmark the permalink.